This article was first posted in the globalist.com on May 15, 2016, and is reposted here with kind permission. 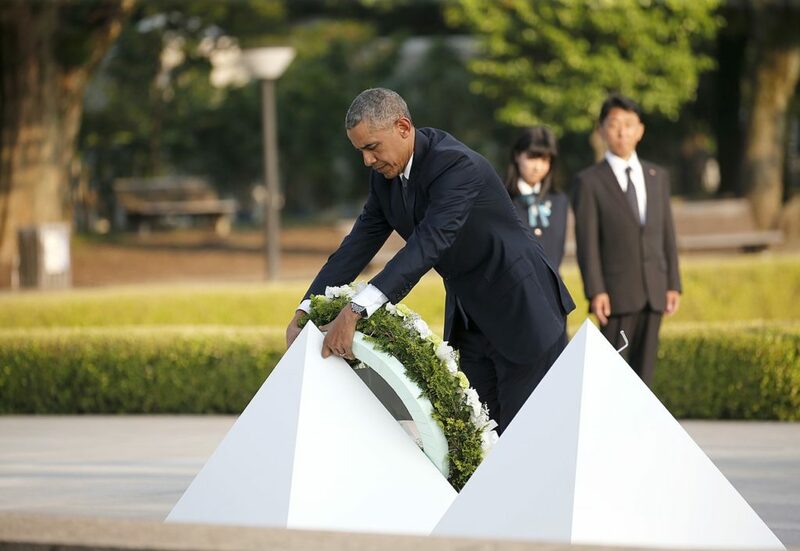 The president’s decision to go to Hiroshima near the end of his term to affirm a commitment made at the beginning of his administration is no doubt a legacy-burnishing gesture. Yet there is also a substantial seven-year record to offer up. Channeling Lincoln at Gettysburg, Obama will try to turn a moment of mourning into a rededication to “unfinished work.” Like Lincoln he knows he can’t complete the impossibly ambitious task. But the course must be confirmed and the work must continue. Hiroshima evokes a spirit and power of place. The iconic mushroom cloud of the fateful day is a staple of popular culture. Yet we know through hundreds of oral histories and journalistic accounts that the human experience on the ground was beyond capture in a photograph. Amid the bowed heads at the inevitable wreath-laying ceremony, the moments of silence should conjure up the sights, sounds, and smells of the morning of August 6, 1945. There is no avoiding the reality of incineration, irradiation, and death. Statistics are inadequate to convey the human cost. But the numbers must be remembered for their enormity: 80,000 instant deaths, 140,000 estimated in total. The average age of the hibakusha (survivors) is now over 80. Some will be present for the speech, as will Japanese Foreign Minister Fumio Kishida who was born in Hiroshima twelve years after the war ended. As a baby boomer who grew up in the shadow of the bomb, Kishida understands the duty for his generation. “I would like to take the baton of peace from the atom bomb survivors,” he said recently, quoting a Japanese youth delegation. It is the next generation’s turn to honor the memory and nurture it as legacy of peace and hope. With the passing of survivors also comes the passing of the veterans who fought on both sides. They too were victims of war. For this reason, and for the continued belief in the rightness of the Allied cause, there will be no apology from President Obama. There would be no benefit, moral or otherwise, to apologize. The United States and Japan are not in the process of reconciliation. All claims have been settled. The United States and Japan have created an enduring and deep friendship. To go down the road of apology would be self-defeating. It would begin an endless cycle of recriminations about Pearl Harbor, Nanjing, and so on. Was the use of the weapon an absolute necessity? There are strong arguments that a demonstration blast on a remote island would have convinced the Japanese leadership that all was lost. There are also arguments that a negotiated surrender without the use of the bomb might have feasible in due course. We will never know. We do know that President Truman never hesitated to use the weapon to end the war and that the decision brought with it a heavy burden of moral compromise. As time goes by, 71 years and counting now, an American president cannot lose sight of the view from the trenches in those days of 1945. In the summer of 1945 the Allies were losing 7000 soldiers per week. On Okinawa alone there were 12,000 Allied dead and 38,000 wounded. Japanese dead numbered more than 100,000. The writer Paul Fussell has written movingly about this period. He was attached to the Forty-fifth Infantry Division which had already been through the European campaign and was being reconstituted to invade the Japanese home islands. Whatever one thinks of Truman and Fussell, the question remains, what is to be done now? The current situation is not good. Nine countries possess more than 15,000 nuclear warheads. As Obama said in Prague, “The technology to build a bomb has spread. Terrorists are determined to buy, build, or steal one. During his time in office President Obama convened four nuclear security summits with dozens of heads of state. He will use the Hiroshima moment to bring attention to the accomplishments and aspirations coming out of these meetings. The president will highlight initiatives such as a New Start Treaty with Russia designed to reduce nuclear stockpiles by 30 percent; a proposed treaty banning the production of fissile material; a standing request to the United States Senate to ratify the Comprehensive Test Ban Treaty; and of course, the highly controversial Iran nuclear deal. There is serious political opposition to all of these efforts at home and abroad. The United States Senate and Republican leadership are not on the same page as the president. China, India, and Pakistan continue to build up their nuclear arsenals while North Korea remains unstable. These are the choppy political waters through which the president and his successors must sail. There are some things that the United States can do unilaterally and it no doubt will. For example, the United States is in the middle of an upgrade and modernization program intended to shrink its nuclear arsenal, thereby reducing risk of accident or mistake and increasing deterrent capacity by improving reliability, accuracy and yield. This is a controversial strategy requiring the building of new weapons while simultaneously lowering overall numbers. In geopolitical terms this effort can be seen as providing the stability necessary to get things moving in the right direction. Yet, in reality, it causes strident opposition in some quarters, confusion and apathy in others. In any case, as the modernization policy zig-zags its way forward, its estimated cost is $1 trillion. Almost 20 years after the end of the Cold War these wise men of the American national security establishment took a hard look at the facts and came to a radical conclusion: “nuclear weapons are no longer a means of achieving security; in fact, with every passing year they make our security more precarious.” With this manifesto, the Global Zero movement was started. Whether or not nuclear abolition is actually possible seems not to worry the Global Zero team. As the old saying goes, ambition requires that one’s reach exceeds one’s grasp. In other words, we are so far off course now, we need to set an unmistakable goal 180 degrees in the opposite direction to turn things around. Obama assumed office the year after the Global Zero movement began. He gamely picked up the mantle, and it is now time to take stock. It is fitting that Obama’s visit coincides with 2016 G-7 meeting, his last. He and his successor will need these partners and others beyond the G-7 to move the agenda forward. Forging collective action is the principal challenge for American leadership today—not only in nuclear matters, but in a host of other areas. American interests will require newly recharged collaborative efforts around global-scale problems such as refugees, climate change, and terrorism. Nuclear proliferation should be somewhere near the top of the list, even if it does not seem as urgent or dramatic as the others. It is at this global scale, and in the sweep of history, where we see that peace and stability must be earned by channeling, balancing, and restraining power. It is hard-nosed work. But this is the noble work of politics. Abroad, the situation is even more challenging as North Korea defies all conventions while Pakistan, China, and Russia pursue their nuclear prerogatives in their own ways. History teaches that it is counterproductive to invoke platitudes about strength. It is similarly counterproductive to invoke platitudes about brotherhood, sisterhood, and unity of mankind. It is in America’s interest—and within its capacity—to use its power to help shape a system that is good for America and good for the world. Even in a world of brutal competition, there are common values and common interests to find, forge, and pursue. The president will leave office with this message intact. What happened in Hiroshima should be remembered for its own sake and for the future. It should be taught in schools as a signal moment in the history of human civilization, a symbol of the awesome power of science and technology, and the consequences of war. It should be approached with respect and seriousness by news organizations, opinion makers, and national leaders. Man’s inhumanity to man never ceases. It must be faced and restrained. The president’s visit is a time to mark the moment, roll up sleeves, and rededicate ourselves to the proposition that peace is not a high-minded ideal; it is rather an intimate partner of power.